There are often discussions as to what electrical practices are acceptable in bathrooms. Recently, one such discussion focused on whether or not to place light switches within bathroms. And who can forget the photos of switches, receptacles, track lights, and even panels within the bath/shower enclosure? On a visit to Israel, I found that the common practice there was to mount the water heater within the shower enclosure; the enclosures are small enough that the water heater gets well rinsed with each shower. The electric power connects in the pan under the heater. Interestingly enough, the switches for the heater, as well as the light, are located outside the bathroom for "safety." Since many of these heaters come from panels that have replaceable element (wire-type) fuses, I assume that there is no GFI-type device. 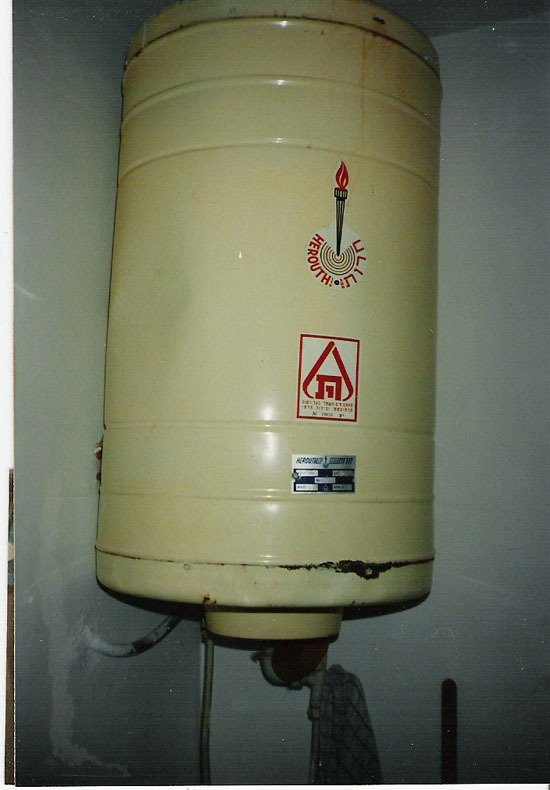 The photo shows one such heater. The large red lable with a caliper-like symbol is the "Teken," the mark of the local UL-type agency. I heard many accounts of these heaters rupturing, but none of any shocks. Thinking about it, I suppose this isn't too far removed from the instant electric showers which are common in Britain, although admittedly ours are plastic cased and we have the feed coming in through the rear, not looped like this within the cubicle! It's quite incredible really that our rules allow a 240V-powered heater inside the shower compartment, but not a normal receptacle located safely out of harm's way over a basin. Could be a main GFI separate from the panel, as is common in the U.K. and Europe. Quite right, Paul. I must say that, at the time, I was not in the trade, and had no idea of what I was looking at. John, do you remember what type of wiring method was used to connect this heater? It looks almost like cord, or some type of loom. The typical wiring method in Israel is to use a rotohammer to chisel irregulat trenches in the block wall, insert 'smurf' tube and boxes, then plaster over. The wires are similar to THHN, but are capped by little terminal strips - look like but splices with screws. The appliance wires are then connected to the free screw. What you see is almost certainly a fabric-wrapped appliance lead. capped by little terminal strips - look like but splices with screws. Are they anything like these British strip connectors? I use those connectors all the time for fire alarm systems. One of the states I work in will not allow wire nuts for fire alarm work. They are also handy when space is tight, they take up less space and wire then wire nuts. A great help if a wire is short. Yes, Paul, those are them! Typically, sections are broken off and used as needed. I noted that type of setscrew connector when I visited friends in Germany a while back. They explained that the practice there was when you move, you take your light fixtures with you. Are those types of connectors permissable for use in residential applications in lieu of wire nuts in this country (US)? We still colloquially refer to these as "Choc blocks" or "chocolate blocks," because years ago the plastic was most often black or dark brown rather than translucent (although other colors such as blue and white were available as well). With the older, more solid types you generally needed to use a sharp knife to cut off however many connectors were needed, but with the newer types pictured above you can just twist them off.